I enjoy getting out of the studio sometimes, and working with children in schools (KS1/2) and at Book Festivals. I have a particular interest in working with children with special educational needs. I’m happy to weave a workshop session around one of my books – masks and mirrors from The Glassmakers Daughter, for example, or a jewelled paper garden from The Elephant’s Garden. An hour long session includes showing original artwork, drawing for the children and giving them an activity, often involving a new art or craft technique. I am also Artist-in-Residence at The Islington Centre for Refugees and Migrants, where I work alongside writer Sita Brahmachari encouraging clients to express themselves through words and images. For more information, costs, or to discuss a project, please contact me. I hold an Enhanced Disclosure & Barring Service Certificate and Public Liability Insurance. 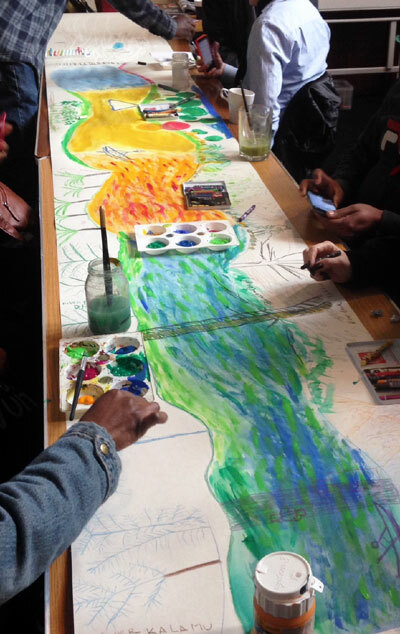 Art session at the Refugee Centre.